Diana has inspired me to grow watermelons. It turns out they are not as hard as I would have thought. Living in Canada I can’t realistically grow at 40b watermelon but I can try a 4 lb. miniature type that will mature in 40-60 days. 3 weeks prior to the time when the danger of frost is completely gone (watermelons are sensitive) – stick 2-3 seeds in each pot. 3. Move them outdoors when frost free. Plant the pots in well good drained soil at least 4 feet apart, (foliage can grow even bigger) in sunny windless area. The pot should go into a hole twice as big as the pot which is filled with good soil and lots of compost. Watermelons like lots of sun, water and compost. Remove all weeds around as they are watermelon plants are not robust enough when young to compete. 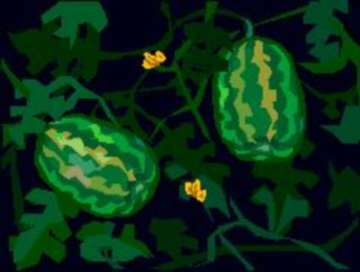 Watermelons are ready to be harvested when they’re light green and their tendrils are brown and crispy. The green color should be a bit dull, and the bottom should be yellow. Pushing your fingernail through the melon should also be difficult. 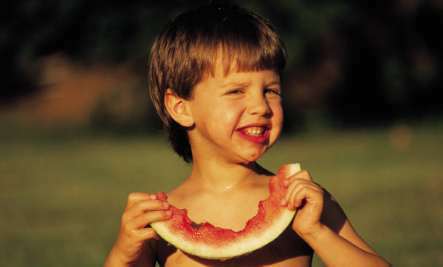 Tapping on the watermelon should give a DULL thump. A certified Nutritional Consultant, Randy has been teaching health and personal development principles for over 30 years and has personally helped individuals with over 10,000 Body Health Assessments.